Chocolate chip cookies are hands down my favorite dessert. They’re the one treat that I really craved while we were on Whole 30, and there’s a reason why chocolate chip cookies were repeatedly the item I chose to give up at lent. The love is 15+ years strong, so I think it’s here to stay. The funny thing about my love for chocolate chip cookies is I never really had my own tried and true recipe. Whenever I craved cookies, I would just do a quick Pinterest search and make whatever recipe looked the best. I also find the break and bake Nestle cookies to be simply delicious, so why re-invent the wheel? These cookies started from a Pinterest search, but when I decided to double the recipe and realized that I was low on certain ingredients, I made some swaps and got these delicious cookies. They taste like the most delicious sugar cookie that chocolate chunks got dropped into. They’re the perfect balance of soft and crisp and were a hit at my girls night (becuase there have to be chocolate chip cookies at girls night). In a large bowl, sift the flour, baking soda, and salt together. In a separate bowl, mix together the butter and sugars. Add in the egg and vanilla and mix until fully incorporated. Slowly add the flour mixture to your wet ingredients until just incorporated. 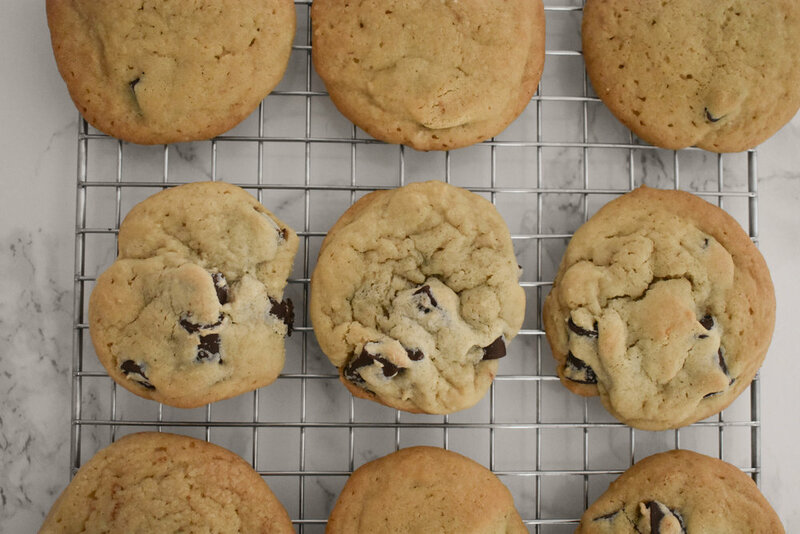 Spoon out tablespoons of dough onto your baking sheet, leaving space between the cookies. Bake for 12 minutes or until golden brown. Allow the cookies to cool before transferring to a wire rack.